Left Heathrow on 4/1 on my least favourite airline - British Airways, flight was uncomfortable and food was mediocre, as British Airways always is. Shanghai - An airport and a cruise terminal to be avoided. Endless form filling, endless fingerprint scans, endless photos, endless baggage scans. Then we were told that the ship will be late docking due to poor weather visibility. Thankfully Princess arranged several coaches for a tour of Shanghai including a lunch and visits, we were shattered and just couldn&apos;t muster any enthusiasm and losing the will to live! Eventually got to the Cruise Terminal and more fingerprint scans, more photos and more baggage scans, then a long route march to the ship, and so to bed! 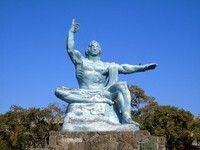 Nagasaki - A very interesting city that we visited on a Princess tour and a city I would like to revisit. Busan - A city I could take or leave, the tour of Boxcheon Tombs and their associated museum started off interesting then it was like doing a degree course in an hour or so, an hour in a department store was underwhelming. Hong Kong - Pity the ship&apos;s Port Lecturer kept harping on about Kowloon, Kowloon and Kowloon and ignoring the existence of Hong Kong Island, thankfully we have friends and family there so we did our own thing on the Island including riding on the famous Hong Kong Trams. Ho Chi Minh City - Stayed on board and I can describe Phu My as one of the least interesting Container Ports in the World! Bangkok - Been there before, so we stayed on board and Laem Chebang is one of the more interesting Container Ports in the World with plenty of activity! Ko Samui - Very Interesting but the road journeys reminded my wife of her early days in the Philippines. Two Buddhas and a coconut-picking monkey later, we headed back to the ship and then to Singapore where we spent a week with family there. Singapore - Been there 12 times in 20 years and can&apos;t keep up with the changes, but we love the place! Now for the Ship - This was our third cruise on Sapphire Princess since May 2018, so we&apos;re used to the ship. Here are the significant differences between an Asian cruise and a Southampton-based cruise. Food - extremely salty and played havoc with my blood/sugar levels, being Type 2 diabetic, I chose to eat less and not eat every night in the main dining rooms, I quite like Asian cuisine but after a week my stomach was yelling for something less salty and much more substantial, Alfredo&apos;s Pizzeria came to the rescue! Entertainment - Other than the Princess Singers and Dancers productions, the guest entertainers varied from the dire to the downright awful, had they performed on a Southampton-based cruise, they would risk playing to either an empty Princess Theatre, or facing an audience reminiscent of one at the bad old days of the Glasgow Empire whose stony silence saw off an act in minutes! Piazza Entertainment - Great watching Princess Singers and Dancers rehearsing on a port day and having a chat with them afterwards and great seeing their polished performance, but some of the Cruise Directors staff must&apos;ve forgotten that they were on a cruise ship and thought they were working at Butlins, especially with games designed for children to be played by adults. Overall Summary - Good in parts, but give me a Southampton-based cruise at any time. The Curate's Egg!!! - Good in parts!!! Left Heathrow on 4/1 on my least favourite airline - British Airways, flight was uncomfortable and food was mediocre, as British Airways always is. Shanghai - An airport and a cruise terminal to be avoided. Endless form filling, endless fingerprint scans, endless photos, endless baggage scans. Then we were told that the ship will be late docking due to poor weather visibility. Thankfully Princess arranged several coaches for a tour of Shanghai including a lunch and visits, we were shattered and just couldn&apos;t muster any enthusiasm and losing the will to live! Eventually got to the Cruise Terminal and more fingerprint scans, more photos and more baggage scans, then a long route march to the ship, and so to bed! Nagasaki - A very interesting city that we visited on a Princess tour and a city I would like to revisit. Busan - A city I could take or leave, the tour of Boxcheon Tombs and their associated museum started off interesting then it was like doing a degree course in an hour or so, an hour in a department store was underwhelming. Hong Kong - Pity the ship&apos;s Port Lecturer kept harping on about Kowloon, Kowloon and Kowloon and ignoring the existence of Hong Kong Island, thankfully we have friends and family there so we did our own thing on the Island including riding on the famous Hong Kong Trams. Ho Chi Minh City - Stayed on board and I can describe Phu My as one of the least interesting Container Ports in the World! Bangkok - Been there before, so we stayed on board and Laem Chebang is one of the more interesting Container Ports in the World with plenty of activity! Ko Samui - Very Interesting but the road journeys reminded my wife of her early days in the Philippines. Two Buddhas and a coconut-picking monkey later, we headed back to the ship and then to Singapore where we spent a week with family there. Singapore - Been there 12 times in 20 years and can&apos;t keep up with the changes, but we love the place! Now for the Ship - This was our third cruise on Sapphire Princess since May 2018, so we&apos;re used to the ship. Here are the significant differences between an Asian cruise and a Southampton-based cruise. Food - extremely salty and played havoc with my blood/sugar levels, being Type 2 diabetic, I chose to eat less and not eat every night in the main dining rooms, I quite like Asian cuisine but after a week my stomach was yelling for something less salty and much more substantial, Alfredo&apos;s Pizzeria came to the rescue! Entertainment - Other than the Princess Singers and Dancers productions, the guest entertainers varied from the dire to the downright awful, had they performed on a Southampton-based cruise, they would risk playing to either an empty Princess Theatre, or facing an audience reminiscent of one at the bad old days of the Glasgow Empire whose stony silence saw off an act in minutes! Piazza Entertainment - Great watching Princess Singers and Dancers rehearsing on a port day and having a chat with them afterwards and great seeing their polished performance, but some of the Cruise Directors staff must&apos;ve forgotten that they were on a cruise ship and thought they were working at Butlins, especially with games designed for children to be played by adults. Overall Summary - Good in parts, but give me a Southampton-based cruise at any time. This is the second time we&apos;ve stayed in this cabin and as usual it is a reasonable size and well equipped with a very comfortable bed and fully functioning bathroom. Ignored all advice from the Port Lecturer as she kept harping on about Kowloon, Kowloon, and Kowloon yet ignoring the existence of Hong Kong Island. We have friends and family on the Island and so they were our guides especially when we rode on Hong Kong&apos;s amazing little trams!! Interesting tour of Ko Samui visiting two Buddhas and watching monkeys picking coconuts. Weather was against us.